Stanley William Hayter was a printmaker and painter whose style evolved from Automatist Surrealism in the 1930s to Abstract Expressionism and other stylistic directions from the 1940s onward. Hayter is regarded as one of the most proficient printmakers of the 20th century. His career in art led him to Paris in the mid 1920s, where he established an internationally acclaimed printmaking studio called Atelier 17. After the outbreak of World War II, he moved to New York, returning to Paris in 1950. While in New York, Hayter was influential on the emergence of Abstract Expressionism. 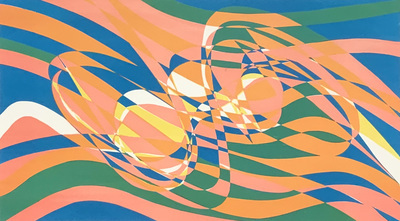 The artwork by Hayter might be classified within the Op Art movement of its time, it also has qualities based on the artist’s unique vision—revealing Hayter’s imaginative approach during the 1970s as well as his fascination with mathematics, vibrant analogous and complimentary colors, and lyrical linear waves that imply motion.